1. THEY START LEARNING IN THE WOMB. The parts of a baby’s brain that process sound start working during the third trimester of pregnancy, and it can remember what it hears in the womb after it’s born. For instance, one study found that Swedish infants only 30 hours old could differentiate between Swedish vowel sounds and the unfamiliar vowel sounds of foreign languages. Another found that when expectant mothers listened to a soundtrack with a made-up word, the infants recognized that word and its variants after birth. 2. THEY START PROCESSING LANGUAGE LIKE ADULTS AT TWO DAYS OLD. At just a few days old, infants use language processing skills similar to those adults use. People remember the beginning and ending syllables of a word more clearly, and listen for those semantic edges more carefully, since they often contain things like verb tenses and information about whether a noun is plural or singular. A 2015 study finds that long before they can talk—within two days of birth—infants are already using this trick, and can distinguish even when there’s a 25 millisecond pause between syllables or a small discontinuity in the sound that might indicate a different word or two separate words. 3. MOVING THEIR MOUTHS HELPS THEM LISTEN. Infants need to move their tongues to distinguish between sounds, according to a study of 6-month-old infants. Psychologists and audiologists found that when a pacifier prevented babies from moving their tongues, they were not able to distinguish between two novel “d” sounds. When babies watch an adult use a specific body part, their brains light up in the areas that correspond with that particular movement. A study of 14-month-old infants found that watching an adult touch a toy with her hand or foot activated the same regions in the infants’ brains associated with moving a hand or a foot. This neural empathy might help babies learn to imitate adults and make the same movements themselves. 5. TOUCH HELPS THEM UNDERSTAND WORDS. A 2014 study from Purdue University found that infants relate touches to the sounds they hear at the same time. Every time the experimenters said the nonsense word “dobita,” they touched the infant’s knee. Once, the infant was touched on the elbow at the sound of another nonsense word, “lepoga.” In a subsequent language study, the infants pulled the word “dobita” out of a stream of words, suggesting that the consistent touch helped them learn the word. 6. SOCIAL SKILLS HELP THEM ACQUIRE NEW LANGUAGES. Several studies have found that social interaction is key to babies’ early language acquisition. One study of 10-month-old babies who received Spanish tutoring found that when babies tracked their tutor and the toys she was holding more carefully, the infants had a boost in brain response. In other words, their social interaction boosted their ability to absorb the lesson. Previous research has shown that babies learn better through interactions with people than through video or audio recordings. 7. THEY LEARN MUSIC VERY EARLY. Before a child learns to understand language, talking sounds a lot like music—it’s repetitive and rhythmic. “So while music and language may be cognitively and neurally distinct in adults,” as psychologists write in a 2012 review in the journal Frontiers in Psychology, “we suggest that language is simply a subset of music from a child’s view.” The authors suggest that a child’s understanding of music parallels its initial acquisition of language, and merits a central place in our understanding of human development. A 2012 study of 1-year-old infants found that interactive music classes lead to better communication. The babies learned to play percussion instruments and sing songs with their parents in an early music class. Compared with a control group, these children showed a greater sensitivity to musical structures and tones, along with better early communication skills like waving goodbye or pointing to an object they wanted. Babies develop a sense of humor around 18 months old. One recent study found that laughing can help kids learn new tasks. In it, 53 babies were taught to retrieve a toy duck with the help of a cardboard rake. Babies that laughed in response to the researcher’s demonstration were much better at performing the task than a control group. Almost 95 percent of the kids who laughed raked the duck over successfully. Infants learn best when they’re surprised, a recent study found. When an object behaved in an unusual way—like a ball that appears to pass through a wall—11-month-old babies paid more attention to it, and chose to explore it more. They handled the ball and tried to test its solidity, learning more about the world in the process. When the ball behaved in predictable ways, they didn’t focus on it or try to learn more. 11. THEIR BRAINS ARE SHAPED BY EXPECTATION. Very early in life, infants learn to make predictions based on their previous experience. A study of 5- to 7-month-old infants found that the part of the brain that responds to visual stimuli also responds to just the expectation of seeing something. The researchers showed a group of babies a pattern of images and sounds—a honk or a rattle followed by a red smiley face. When they stopped showing the image but played the sounds, the babies still showed activity in the visual response areas of their brains. If babies didn’t spend so much time sleeping, they probably wouldn’t remember what they learned. 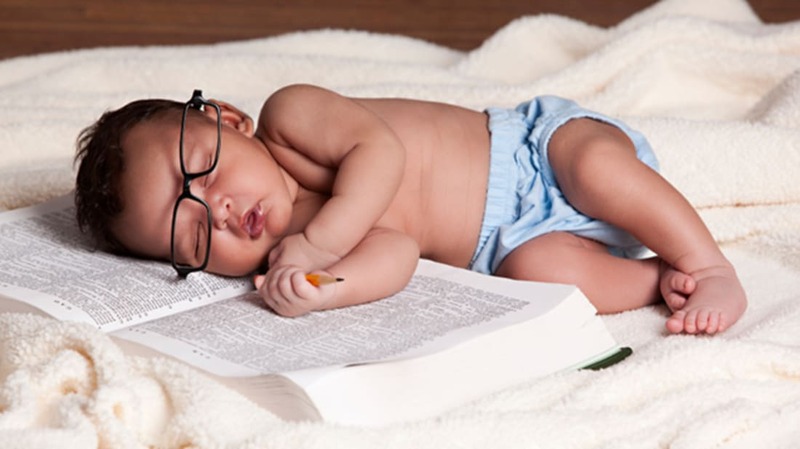 Infants are constantly learning during their first year, and they’re also constantly napping—they’re rarely awake for more than four hours at a stretch. In an experiment where researchers taught babies how to remove a puppet’s mitten and find a hidden bell, infants who napped right after the demonstration were better at recalling the demonstration. This ties in with research that finds that adults, too, consolidate memories as they sleep. 13. THEY CAN LEARN FROM ANIMALS. Think your baby is only listening to you? Think again. Infants can also learn from lemur vocalizations, a 2013 study found. In it, 3-month-old babies looked at images of dinosaurs while some sort of sound played in the background—human speech played backwards, and lemur shrieks. A previous experiment found that babies learned categories of dinosaurs better when human speech played. However, the backward speech—essentially just random sound—didn’t help the babies learn. The shrieks of lemurs, however, did, suggesting that even if babies don’t understand the language, vocalizations can stimulate their learning process. 14. THEY LEARN TO ENJOY CERTAIN FLAVORS AND SMELLS BEFORE THEY’RE EVEN BORN. Babies’ senses start working before they’re even born, and they can learn to enjoy certain flavors and odors in the womb. One study found that babies whose mothers drank carrot juice for three weeks straight during their last trimester of pregnancy enjoyed the flavor of carrots more when their mother introduced them to solid foods compared to infants who hadn’t been exposed to carrot juice in the womb and during lactation. Another study found that infants whose mothers consumed anise (a plant with a similar flavor to licorice) during pregnancy showed a preference to the smell immediately after birth and when they were four days old. Babies in the control group showed a clear aversion or no response to the smell. 15. BUT THERE ARE LIMITS TO WHAT THEY CAN LEARN. While infants’ capabilities for absorbing new information are amazing, they aren’t miraculous. Some educational companies advertise the ability to make even a 3-month-old literate, but a 2014 study of infants and their parents found that literacy DVDs and other media tools geared toward infants under 18 months weren’t effective in establishing the ability to read. They did, however, make the parents feel like their kid was learning.